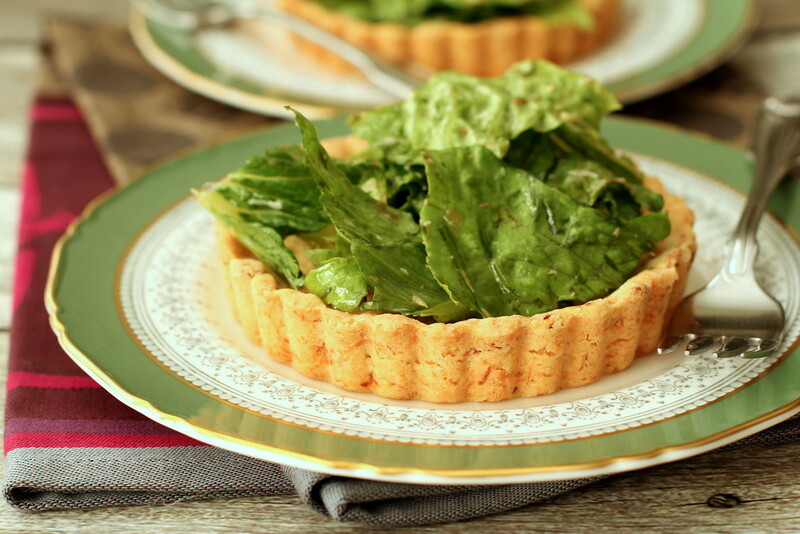 How elegant would it be to serve these Caesar Tartlets with Sweet Garlic Butter Crusts at a dinner party? Your guests would be blown away. Instead of serving the salad with the traditional garlic croutons, just place the salad in this flakey, garlicky, buttery, and cheesy crust. Ah-maze-ing. Your guests will be raving about it for days. 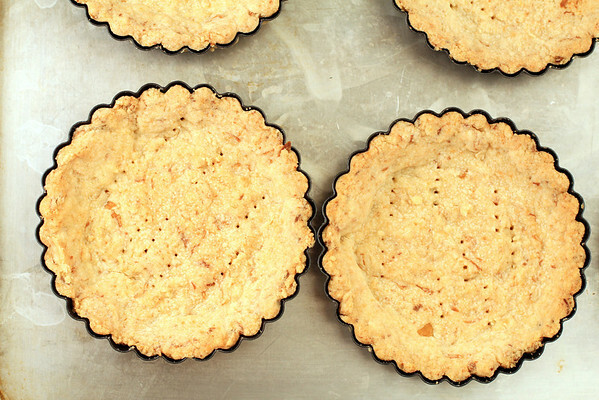 The pastry crusts are loaded with sweet roasted garlic. Heavenly. The crusts can be made a day or two in advance, wrapped in foil, and refrigerated until your elegant party for eight or romantic dinner for two. If you are nervous about raw egg in your Caesar dressing, this version will make you happy. While not as creamy as traditional Caesar, it is crazy delicious. I think the difference is the addition of crushed capers. This will be my go-to Caesar dressing forevermore. This is not hyperbole (well, maybe, but it's the best Caesar dressing I've ever tried... so far). And you can make it up to three days in advance. All you need is fresh romaine and grated Parmesan and you have a stunning garlicky first course. Cut the tops off of the garlic heads and sprinkle with the olive oil. Wrap in foil and bake for about 40 minutes. Remove the garlic heads from the oven and allow to cool. Remove the cloves of garlic with a small fork and place them into the bowl of a stand mixer. Add the butter, cheese, and salt, and mix with the paddle attachment for about a minute. Add the flour and mix for another minute, until just crumbly. 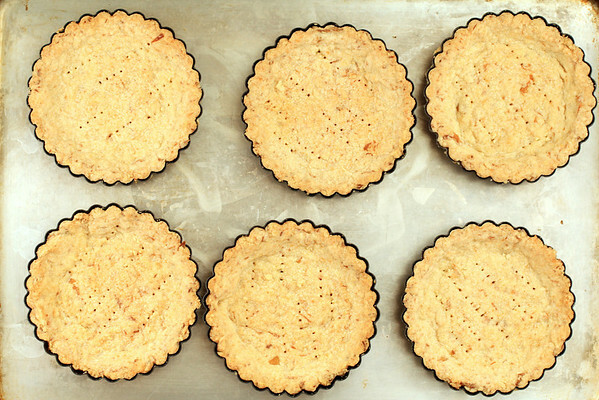 Divide the dough among 8 four inch tart pans and press into the pans. "Dock" the crusts with a fork. Place the pans onto a cookie sheet and bake for about 20 to 25 minutes, until lightly browned. Cool on the cookie sheet on a rack. At this point, you can wrap them in foil and refrigerate. Add all of the ingredients into the bowl of a small food processor and pulse. 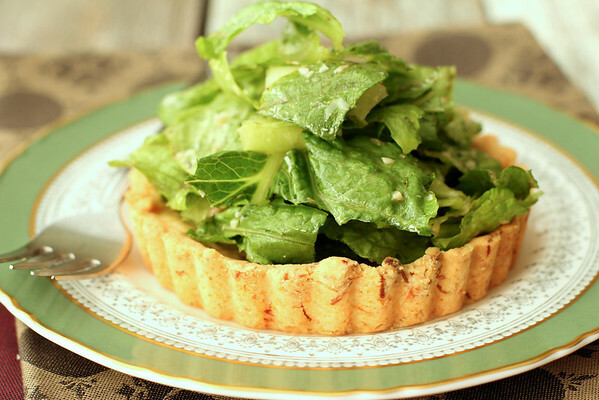 Place each tartlet on an individual salad plate. Toss the romaine with the dressing and the Parmesan. Divide the salad among the crusts. Serve and bask in the glory. Recipe adapted from Savory Baking: 75 Warm and Inspiring Recipes for Crisp, Savory Baking. To enter, simply leave a comment on this post (mandatory) answering this question: What is your favorite GARLICKY dish (or one that you'd love to try)? After you've answered the question for entry into this contest, be sure to record that you did so in the rafflecopter widget below; doing so will unlock many more optional ways to earn entries. a Rafflecopter giveaway This giveaway is open to residents of the Continental USA. Entries will be accepted through 11:59 pm ET on Thursday, April 24, 2014. All entries will be verified. A winner will be chosen from qualifying entries via random draw, and notified via email within 48 hours of the close of this contest. The winner will have 24 hours from the time the email is sent to respond with their complete name and mailing address (no P.O. Boxes). If no response is received within 24 hours, a new winner will be chosen. Prizes provided by The Garlic Seed Foundation, Food Lust People Love and girlichef. Prizes may vary slightly from images shown and are subject to replacement with comparable items if ones pictured are no longer available at the close of this contest. Items may be shipped separately. What a great idea, Karen! I can think of a thousand things I'd love to put in a garlicky crust like this, Caesar salad being only one of them. Pinning on my Recipes to Try board! 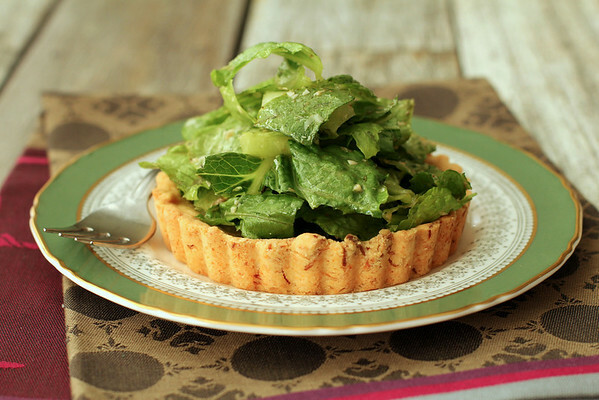 What a great way to serve a Caesar salad! Love it! I close my eyes and I can smell that garlic crust! YUM! These are beautiful!!! What a great presentation idea for a salad...and the crust my be to die for! I was excited to try this Renee! I would have a dinner part all by myself if that's what it took to get these, Karen. They are absolutely mouthwatering - I need them! =) Thanks for the wonderful event! Love, love, love! I'm drooling over the garlicky crust.. I so need to make these. You've inspired me to dip into my overabundant collection of cookbooks! Very creative use of garlic! I must remember this for my own dinner party. I love the look of these mini tarts! I would have never thought of this but it's genius!!! My husband is a huge Ceasar Salad fan and I know this combo would really be enjoyable for him. Lovely way to serve a ceasar salad to company! I was wondering whether I am reading the butter measurement correctly. Is that 1 cup of butter or 2 sticks of butter? Thanks Laurie! It's either or, as they are the same thing here in the States. I guess it does look a bit confusing! Love the presentation and the way these look, a true showstopper! Oh yum what a fun way to eat salad! My favorite garlic "dish" is garlic bread, hands down. Love garlic in just about everything I eat, though. This looks ah-mazing! Love ceasar salad. I'd like to make the Chicken with 40 Cloves of Garlic dish! So elegant! Love these Karen!